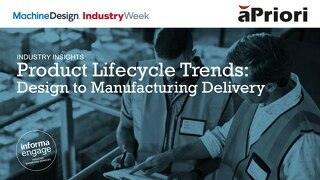 In a research study conducted in Fall 2018 by Machine Design/Industry Week in partnership with aPriori, respondents report a reasonanable curve in how product design-to-delivery schedules have changed over the past three years. This research confirms that there is a significant pressure on product development teams to innovate, detail, test, and release new designs to manufacturing in less time than ever before. Download this white paper for fascinating industry statistics and suggested solutions. Need to Reduce Product Costs? Request a Demo Today! 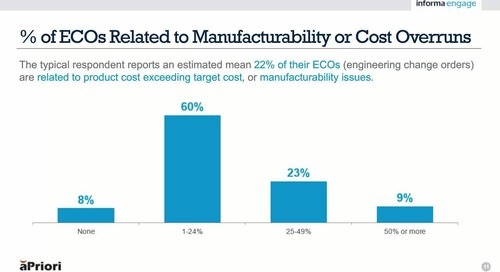 71% of respondents to a recent IndustryWeek/Machine Design and aPriori survey reported increases in their product design-to-delivery costs over the past three years. Download the research report. Infographic: 6 Key Trends and Takeaways That Affect Profitability and Time to Market based on a Summer 2018 survey conducted by Industry Week, Machine Design, and aPriori.